Basalt fibers are use in two methods, either as a composite in a Fiber reinforced polymer (FRP), so as to give the final product better properties, or as a material to make finished products for application. The basalt fiber market is an emerging market, with not many players in the market nor are there large amount of consumers. Basalt fiber is gaining popularity due to its superior properties, of thermal and cold resistance, tensile strength and chemical corrosion resistance as compared to Fiberglass and other FRP products. The leading producers of basalt fibers are from Europe and Russia. The market for basalt fibers is expected to grow exponentially within the forecast period. The market for basalt fibers has only now emerged, with the composite industry gaining popularity and composite material becoming part of global technological advancements. Basalt fibers have various advantages as compared to glass fibers such as superior thermal protections, exceptional durability, environmental friendly, high tensile strength and very good chemical and corrosion resistance. Basalt is mainly manufactured for two uses, as composites material and as material for finished products development. They are manufactured from molten basalt rocks as Continuous Basalt Fibers (CBF) filaments, which may then be chopped, roved, matted or processed in other ways. The composites then undergo different processing methods to be mixed into the polymer matrix and then be produced as a finished product for the composite market. One of the growth drivers for Basalt fibers is its superior performance as compared to fiberglass. It showcase better chemical resistance, corrosion resistance, tensile strength and durability in comparison to fiber glass. It is also environmentally friendly and is easily recyclable. The production of Basalt fibers is also a fairly simple process. It can be summarized in short as Stone + energy = fibers. This simplicity makes it an attractive item for production considering its superior performance and the fact that its raw material is basalt rocks which makes up a third of all the igneous rocks on Earth, which is a lot of raw material. Despite the ease of production and its superior properties Basalt Fiber has not yet been completely adopted by the industry. This is due to the presence of competition from other composite fibers such as carbon fibers and glass fiber which act as a restrain on the market. Another factor that poses a challenge for the Basalt fiber market is that its cost of production is higher than that compared to fiber glass and the dependency of ores of basalt rock form a geographical constraint on the basalt fiber production as otherwise they will increase transportation costs. The base year of the study is 2017, with forecast done up to 2023. The study presents a thorough analysis of the competitive landscape, taking into account the market shares of the leading companies. It also provides information on unit shipments. These provide the key market participants with the necessary business intelligence and help them understand the future of the Basalt Fiber market. The assessment includes the forecast, an overview of the competitive structure, the market shares of the competitors, as well as the market trends, market demands, market drivers, market challenges, and product analysis. The market drivers and restraints have been assessed to fathom their impact over the forecast period. This report further identifies the key opportunities for growth while also detailing the key challenges and possible threats. The key areas of focus include the types of plastics in the electric vehicle market, and their specific applications in different types of vehicles. Basalt Fiber– By Form: Chopped Fiber, Yarns, Roves, Ropes, Tapes, Mats and others. Basalt Fiber– By Composite Processing Method: PrePregs, Compression Molding, Hand Layup, Resin Molding, Vacuum Infusion, Spray Gun, Filament winding, Resin film Infusion (RFI) and others. Basalt Fiber– By Usage: Composites and Non-Composites. Basalt Fiber– By Application Type: Concrete reinforcement, Roads, Mesh filters, Insulator, Wall Plugs, Spray Application, Refractory Bricks and Blocks, Walls and foundations, Coastline reinforcement, Reinforcement for Sports equipment and Automotive Parts, Industrial flooring and Foundations, Water works, Ship & Boats, Shafts and tunnels, Composites and others. 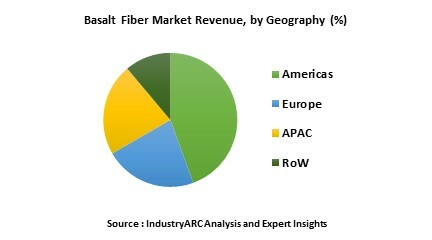 Basalt Fiber Market – By End User Industry: Electrical and electronics Industry, Material Manufacturing Industries, Nautical Industry, Automotive industry, Oil and Gas Industry, Construction Industry, Energy Industry, Chemical Industry and others. Some of the Key players in this market that have been studied for this report include: Galen, Asatec, Isomatex S.A., Fiberbas, Shanxi Basalt fiber Technology co. Ltd., Basaltex, Technobasalt, Basaltfiber-GBF, Basalt Fiber Tech, Mafic Basalt, US Basalt and many more. Major Key players have been participating in Expo’s and Exhibitions so as to make industries and people more aware of Basalt fibers, their features and advantages. This marketing and promotion being done by all the key players in the market is to show case the products and in turn increase the demand for the more superior products that can be used in application. The companies in the Basalt fiber market are also seen expanding their production capabilities, which points towards a trend in increase in demand for Basalt fiber products in the composite market as well as the construction industry. The increase in use of Basalt fibers in the production of construction material as well as Boats points toward a trend in the increase of Basalt Fiber and Basalt fiber composite usage in the Industry. The expansionary activates being taken by companies and countries is going to increase the demand and Basalt fibers and is going to increase its application globally. 17.6. Shanxi Basalt fiber Technology co. Ltd.